And you thought you had heard the last of this trip…well not quite! Our adventure didn’t really end until we reached the airport at Melbourne. Deciding to fly sounded easy. All we needed to do was box up the tandem and organise to get it, and us, home. Our friend offered to get the bike home for us (thank you!) once we had packed it, and the Captain’s sister had the space for us to do the packing. The day after we arrived in Melbourne, we walked the tandem two and a half kilometres to the Captain’s sister’s house. We didn’t ride because we would then have to lug our helmets around and we decided it would be easier just to walk. Once we reached there and locked the bike, the tech-savvy Captain used his phone to locate the nearest bike shop where we might be able to get some empty bike boxes. We would need two because the tandem is longer than your average bike. The nearest bike shop was 1.7km away. That shop didn’t have any empty boxes, so we searched for the next bike shop, another couple of kilometres away. We thought first this time, and phoned to make sure the shop had boxes. They did, so off we went again. After getting the boxes, two of which were folded into a third one, we shared the carrying and walked down the very crowded city footpath to a hardware shop where the Captain picked up the packing supplies, bubble wrap, tape and cable ties. We had walked a block before realising the Captain had forgotten to buy a Stanley knife to cut the cardboard and tape. Feeling a bit too weary to go back, we decided to push on back to the sister’s house anyway (who needs knives to cut with!). Three and a half hours after leaving home in the morning, we reached the Captain’s sister’s house with boxes and packing supplies. The Captain immediately began the packing process while the Stoker located the nearest hardware shop (thankfully only 400 metres away!) and went to buy a Stanley knife. Upon return, the Stoker found the Captain struggling with the poky little multi tool, trying to remove the pedals unsuccessfully. One bent multi tool and two hot and bothered people later, both of us set off back to the hardware store to buy an 8mm Allen key. Of course we had to buy the whole set just to get the one we wanted. By three thirty that afternoon, the tandem was packed and stored on the verandah, and we walked the 2.5kms back to the Stoker’s sister’s house, glad that job was over. By the end of the day we had walked about 18kms! The adventure hadn’t finished however, because, in the spirit of challenging oneself, we booked a ticket on an airport bus to get ourselves to the airport. This would work out great as the bus stop was less than a kilometre from where we were staying…until we realised how heavy our gear would be to carry! 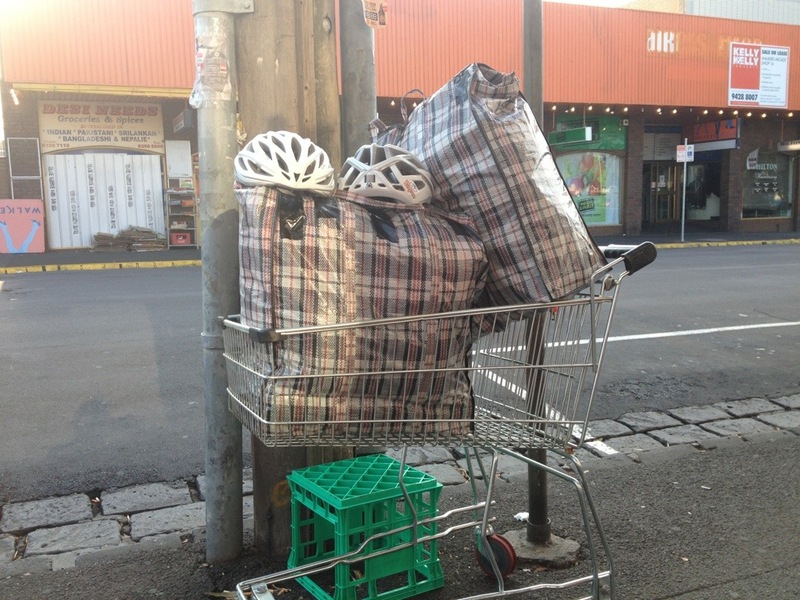 We packed our panniers and tent bag into two big stripy shopping bags. They weighed about 15 kilograms each and had two skinny straps to lift them up with. Good if you want to lose some length in your fingers! Conveniently, there was a stray trolley nearby and rest is history…well, except we waited on the wrong side of a busy four-lane road for the bus and had to get a phone call from the very grumpy bus driver who was early anyway. As fantastically fun and amazing as the trip has been, it will be great to be home! Brings back happy memories of using pigeon-Spanish, or pigeon-Italian in supermarkets to get a selection of large boxes to break down and then tape back together into one giant packing box. One luxury we afforded ourselves was a pukka pedal spanner for the end of the trip (though it sounds like your pedals have a different fitting) – all those miles, all that effort pushing makes for very tight pedals at the end of 800 miles (or more). Thanks again for some great posts. Congratulations on making it on your big adventure! I can’t say how jealous I am that you guys have been out there riding! The big quesiton though… What is next?